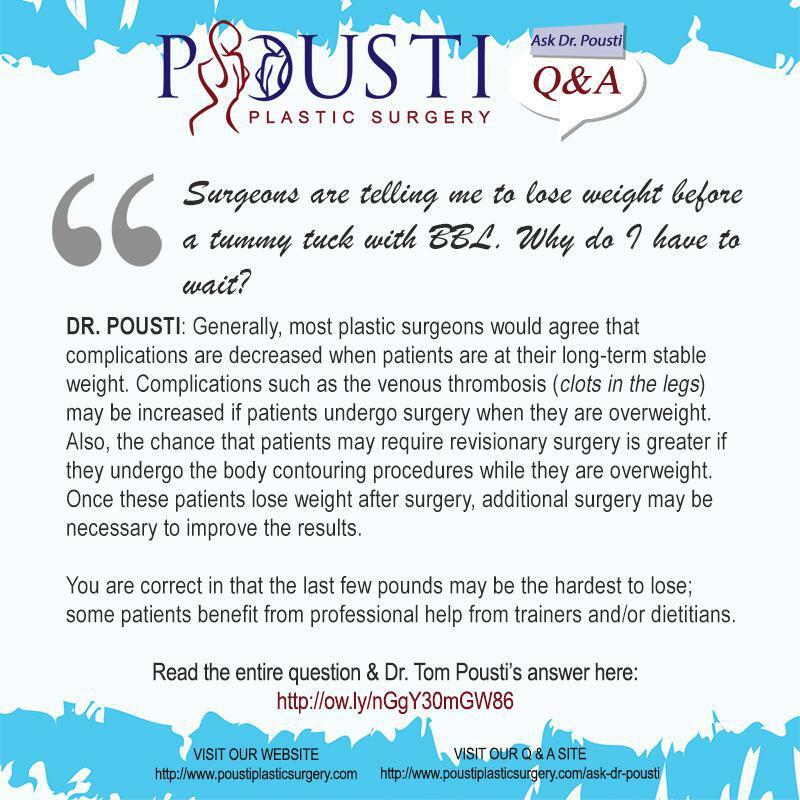 Pousti Plastic Surgery Blog Q&A: SURGEONS ARE TELLING ME TO LOSE WEIGHT BEFORE A TUMMY TUCK WITH BBL. WHY DO I HAVE TO WAIT? "Question Dr’s :Why are most PS tell people here to wait till we lose more weight first?It is NOT that easy.My friend (she 41. )did get a TT (2011)we are from however NYC/NJ.she didn’t wait for target weight,the Florida PS told her no wait. We are same body,one inch apart.I’m 5’9.37.was 289,last year…FINALLY down to 249,,all weight went right to my mid stomach,mom of 2 daughters,both now teens.i have money,time off to get it done! Gracia. " DR. POUSTI: Weight Loss before Tummy Tuck? Generally, most plastic surgeons would agree that complications are decreased when patients are at their long-term stable weight. Complications such as the venous thrombosis (clots in the legs) may be increased if patients undergo surgery when they are overweight. Also, the chance that patients may require revisionary surgery is greater if they undergo the body contouring procedures while they are overweight. Once these patients lose weight after surgery, additional surgery may be necessary to improve the results. You are correct in that the last few pounds may be the hardest to lose; some patients benefit from professional help from trainers and/or dietitians.